I've had a rule in later years not to send reception reports to stations I hear, but no rules without exceptions. Radio Kiribati's new transmitter on 1440 (replacing 846) was audible with surprising quality last October. Today I received a friendly response from Babera Marewenimakin. Thanks Bryan Clark for finding the correct email address. Receivers are not immune to very strong signals. And they exist - it could be your local AM station, the general signal level in your part of the world, or that your radio simply cannot handle the signal level. Conventional receivers often had a tracking preselector which helped attenuating signals outside of its passband. Older receivers more often used a manual preselector. With the advent of software defined radios, capable of recording from 192 kHz up to 4 MHz, a preselector loses its relevance. Some SDRs are "wide open", while others use a set of bandpass filters. 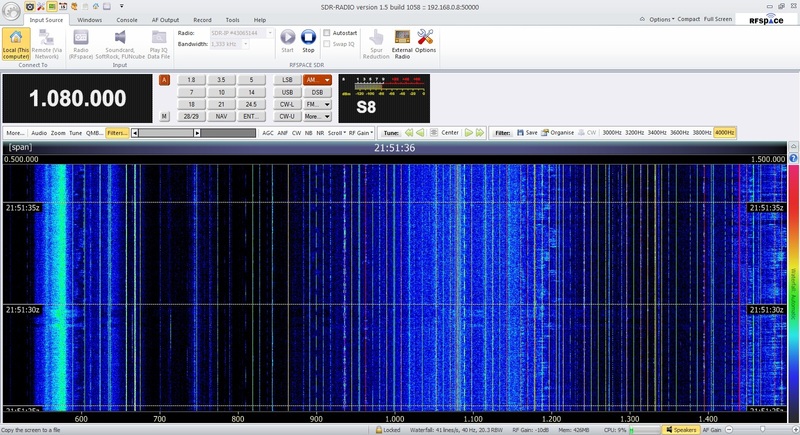 The RF Space NetSDR for instance uses 10 sub-octave filters. The Winradio G33DDC has14 configurable bandpass filters. The Afedri SDR-net on the other side has none, while the G31DDC has a selectable high pass filter to reduce MW interference on SW.
My 100 kHz notch filter was designed by Swedish DX-er Stefan Wikander, is easy to build and was later refined by Dallas Lankford who added a 500 kHz high pass filter to the design. Read more here. When it comes to high pass and low pass filters, there is a limited amount of off-the-shelf products. Tracey Gardner kindly directed me to the Minicircuits range of filters. Unfortunately, almost all their products are aimed at higher frequency ranges, but they have some interesting low pass filters. For the MW DX-er, the 1.9 MHz filter could be very suitable. In addition, the filters are very small with a female BNC on one end and a male BNC on the other. At around USD 35, they are quite inexpensive, too. Clifton Laboratories offer active antennas, amplifiers, filters and other items of interest for the DX-er and radio amateur. The proprietor Jack Smith makes bandpass filters, band rejection filters, high pass filters and low pass filters with superb characteristics. They can be built to meet customers requirements. The price range is USD 40-70, metal cased with connectors. More details on their web page. My low pass filter was bought (un-boxed) from Clifton Laboriatories. Kiwa Electronics has been around for decades. Kiwa offers a wide range of low pass filters, including "Broadcast band rejection filter", i.e. a high pass filter. Prices are in the USD 70-150 range - the more expensive ones allow DC to pass through the filter. The web site does not indicate whether customers requirements are met. I've bought a few preamps from Kiwa in the past, and I've also had a receiver modified there. The proprietor Craig Siegenthaler does an excellent job. Apart from these two, I was advised about Rescue Electronics, which offers low pass filters for the DX-er. However, after the initial positive contact, I did not hear from the company again, not even after a follow-up email. Are there designs out there that the hobbyist can use to make his own filter? Please use the comment field to share your ideas. Those who have read my impressions of the Afedri SDR-net, will know that the receiver is susceptible to overloading, due to its modest 12-bit ADC and lack of band pass filters. Hence, in many cases one will have to reduce the internal VGA gain, which again reduces useable sensitivity. While a bank of band pass filters would be the best solution, the second best is making or buying a filter which eliminates the strong signals - if they are away from the spectrum you want to monitor. I decided to test a low pass filter, so I could eliminate SW signals while listening to MW. I ordered a tailor-made filter from Clifton Laboratories, with a cut-off frequency of 2100 kHz. I put it together today, and you can see the results below. 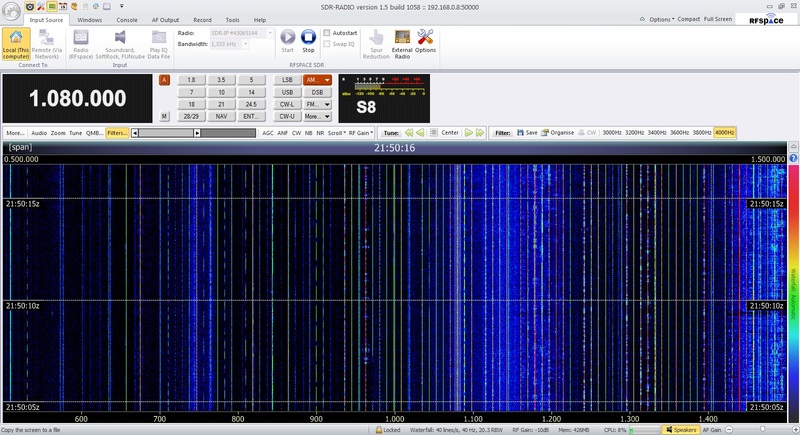 The Afedri had been set up with max VGA gain, but I had reduced the gain by 10 dB in SDR-Radio. Still, I would have a sensitivity of around -104 dBm. The pictures show how the MW spectrum displayed before, and after I engaged the low pass filter. Not only was there a visual difference, the audible difference was huge. In addition to the low pass filter, I also used a combined high pass filter (cut-off frequency 500 kHz) and 100 kHz notch filter, designed and built by Dallas Lankford. There is only one major LF source though, the 250 kW Loran C station on 100 kHz, 14 km away. I didn't do any before-and-after test of this filter, since removing it will kill MW reception regardless of receiver. I probably should have reduced the Afedri's VGA gain another 3-5 dB, but I suppose you get the picture, so to speak. A quick check of the 49 meter band showed that there were no signals left, while before the signal levels were very high indeed. I carried out the test with a 30 meter longwire and a 25 meter long coax feed line.